Here are three highlighted recipients that demonstrate how the fund can be used to further remote community based experiential learning (CBEL) opportunities for UBC students.  In this course nonprofit organizations worked with 16 UBC graduate students to develop a proposal for a real project need brought forward by each organization. The goal of each project team (1 representative from the organization and 2 graduate students) was to build a concrete draft grant proposal. Participating organizations shared that the project has positively impacted the professional development and the ability of their Agencies to develop innovative project ideas and get the funding to turn them into reality. Additionally, this course built student and organizational capacity to work together effectively, develop quality projects and strengthen, and for nonprofits to gain new experiences partnering with the university and all leading to a real impact on real people on the ground since agency leaders were able to develop quality projects and proposals to affect real change on the ground. 20 UBC students participated in a research project aimed at engaging with communities and the environment in a sustainable way. Students partnered with 7 community organizations to work with on one of several possible projects themes: economic sustainability and innovation, social sustainability and citizen communication, environmental sustainability in the surrounding forest and city Centre; demographic shifts, employment and reduction of environmental harm; adapting effective delivery methods of education. 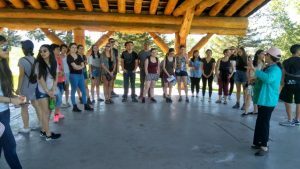 Students and partners expressed excitement and enthusiasm for a continued relationship between UBC Geography and the community of Williams Lake. The Remote Fund was a really positive experience because it greatly reduced the cost of travel and accommodation for the students. The community has really enjoyed having the students visit and we will continue this relationship in future years. Students stayed in a local hotel but in future years we are going to explore host families that will impact the community even more directly. The application form was clear and fair. We did have to wait a little longer than told to receive the actual funds into the department. 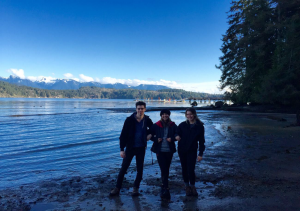 Three UBC students in ENVR 400 partnered with the YMCA Camp Elphinstone in Gibsons, BC to strengthen the camp’s existing environmental science education program aimed at school aged children who come to the camp on school trips. UBC students worked with camp counsellors to connect sustainable practices to camp activities. The project outcome was a wild edibles curriculum for Camp Elphinstone along with training material for camp counsellors and a plant encyclopedia describing local plant species. Supported in partnership with Dr. Mark Turin and students from FNEL 489H, UBC students partnered with the Heiltsuk First Nation in Bella Bella, specifically the Heiltsuk Cultural Education Centre’s ( HCEC) where they spent 120 hours on a series of Heiltsuk language and information organization related projects. The project was developed to contribute to the ongoing organization of the Centre’s collections with an eye towards the use of material in language programs and for other community driven initiatives. The Centre had created and compiled an extensive collection of analogue and digital resources and materials and was seeking support through this project to mobilize access to and use of these materials through new and emerging technologies. “Kim Lawson, Heiltsuk community member and Reference Librarian at UBC’s Xwi7xwa Library, was our mentor. 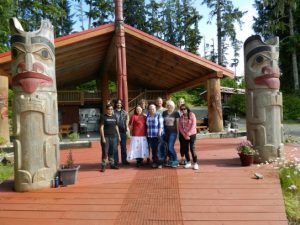 The staff at HCEC, William Housty (Heiltsuk Integrated Resource Management Department Board Chair), Jess Housty (curator of the Thistalalh Memorial Library), as well as the principal and teachers who work in language and cultural programs at the Bella Bella Community School were also generous with their time. Throughout the week we were particularly fortunate to have the opportunity to learn from Jennifer Carpenter, a Heiltsuk community member, scholar and Director of the HCEC. The Centre has created and compiled an extensive collection of analogue and digital resources and materials, and we envision future work could focus largely on community grounded information organization systems that can support the needs of teachers, community members and the goals of HCEC. 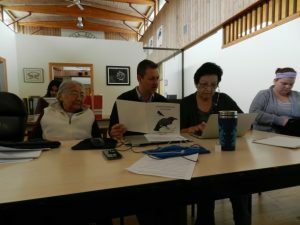 Through an MOU signed in 2016, the Heiltsuk Cultural Education Centre, the Bella Bella Community School and UBC’s First Nations and Endangered Languages Program (FNEL) are partnering in an effort to collaboratively create new opportunities for speaking, writing and reading the Híɫzaqv (Heiltsuk) language by expanding and deepening existing community language revitalization and cultural documentation in a digital environment. In coordination with Lisa Nathan (Assistant Professor at the University of British Columbia’s iSchool, SLAIS), Kim Lawson (Reference Librarian, X̱wi7x̱wa Library, UBC & Heiltsuk community member) and graduate students from the School’s First Nations Curriculum Concentration, FNEL instructor Mark Turin led an intensive, community-based course in Bella Bella in early July 2016. 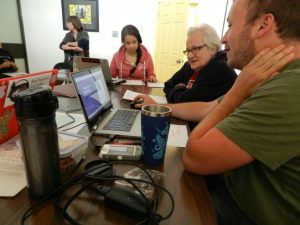 In the course of the week in Bella Bella, FNEL students (two of whom are from the Heiltsuk community) worked with Heiltsuk community members to design and test a cross-platform Híɫzaqv Unicode keyboard, trial a beta version of a searchable online Híɫzaqv Digital Dictionary and digitize a number of unique language resources held in the Cultural Education Centre and the Community School to facilitate wider use and access. At the end of the week, students gave presentations to community language experts on what they had learned through their coursework. Student-led demonstrations of the keyboard input system and the public sharing of student-made Heiltsuk language videos were very well received, with a number of Heiltsuk community members expressing interest in joining future community-based classes for credit should they be offered. 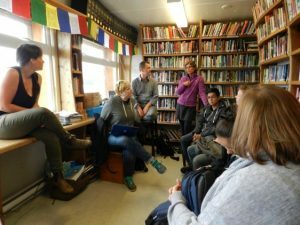 A total of 20 UBC Education students completed community field experience for graduating teachers in rural communities in school district #27, Cariboo Chilcotin. The focus of these placements in rural schools was to foster new relationships and for students to enrich and expand their understanding of the rural setting in which education occurs, including aspects of non-formal education, understanding the role of community in education, and frame an inquiry into places of learning. 100 UBC students participated in the project, supporting 6 school districts, an increase from 4 last year and more districts asking to be a part of the program. As a result of the Fund, approximately 20-25% of all field placements for the enhanced practicum are in rural setting now.